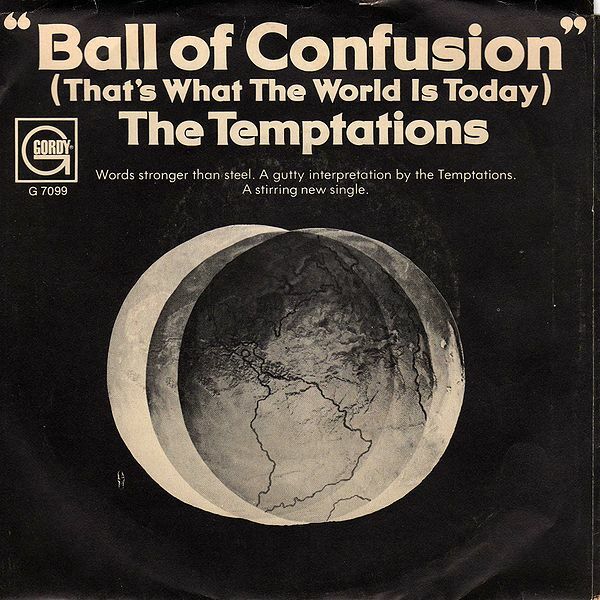 Clocking in at over four minutes, “Ball of Confusion” was an epic by Motown standards. The arrangement and themes, however, were very much in line with the top-shelf, psychedelic social commentary songwriter and producer Norman Whitfield had been consistently turning out. “Ball of Confusion” isn’t exactly a fun song, but it is a lot of fun to listen to. The song was the Tempts’ second strong single of the 1970s, landing in the Top 5 on both the pop and R&B charts. It also marked their third straight solo Top 10 hit. The complex number isn’t easy to replicate, but that hasn’t stopped others from trying. Shortly after the Tempts’ number had dropped in the charts, Berry Gordy handed the tune to another Motown group, the Undisputed Truth, to try their hand. A generation later, pop band Duran Duran and metal outfit Anthrax both released covers in the 1990s. The 21st century also saw a resurgence of interest in the song, with the Neville Brothers, Widespread Panic and Tesla all releasing covers. As “Sesame Street” celebrates its 40th anniversary this week, The Daily Record examines five of the show’s greatest musical moments. Twenty years after “Cry Cry Cry” appeared in jukeboxes, Johnny Cash was singing with Oscar the Grouch on Sesame Street. “Nasty Dan” appears on the classic 1975 record “The Johnny Cash Children’s Album,” but Oscar is the perfect foil for the number. Cash enjoyed his fifth season spin on the Street so much, he returned to Jim Henson’s world of Muppets. In 1980, Cash hosted an episode of The Muppet Show. Cash was also the inspiration behind the 1990s Sesame Street character Ronnie Trash, who sang about the environment in Cash’s classic boom-chicka style. Stevie Wonder between albums and at arguably at the peak of his career when he appeared on the Sesame Street in 1973. In a rare Sesame Street-Soul Train crossover moment, Wonder and his full band performed his recent hit “Superstition.” He then returned with the original number “1,2,3 Sesame Street,” starting a new talk box fad at kindergarteners across the country. This isn’t as much a song as a lesson with the greatest classical violinist of his generation. Itzhak Pearlman was no stranger to Sesame Street when he appeared in this 1981 clip. Polio is all but forgotten today, but the message on disabilities and talent still rings true. This bonus clip is from Ray Charles’ second stop on the Street in 1977. Although he’s just singing the alphabet, there are few artists who could make 26 letters swing so hard.